Kenneth Gold arrived in Keystone alongside the exciting Tommy Suede as Suedes manager and friend. 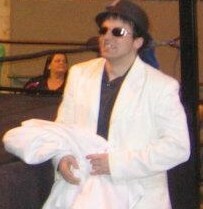 Liem Suede, Gold became a target of the Dark Horsemen and Commissioner Ryan Race. In June of 2012, Gold wa snamed the Co-Commissioner to keep Ryan Race is check.